Jimmy Overend is 85 years old and has been a lifelong Celtic supporter. He lives in St James' in the shadow of the former Celtic Park site. He sent this letter to the Society whilst renewing his membership. My date of birth is 1st July 1924. Back then I became the first boy after three girls in the family. My father was a Belfast Celtic fanatic. So my first ever game had to be Belfast Celtic vs Glasgow Celtic in a charity game here across the road at Celtic Park on May 28th 1928. As I got older I spent my time on the streets playing footbal with tin cans and balls made out of papers and cloth. When my Dad was ill, I'd follow his mates to Celtic Park, get lifted over the stiles. I'd run from school to see the last few minutes of midweek games. No flood lights then. Come 1949 was like a death in the family. Not only mine but throughout Ireland and beyond - especially Scotland. 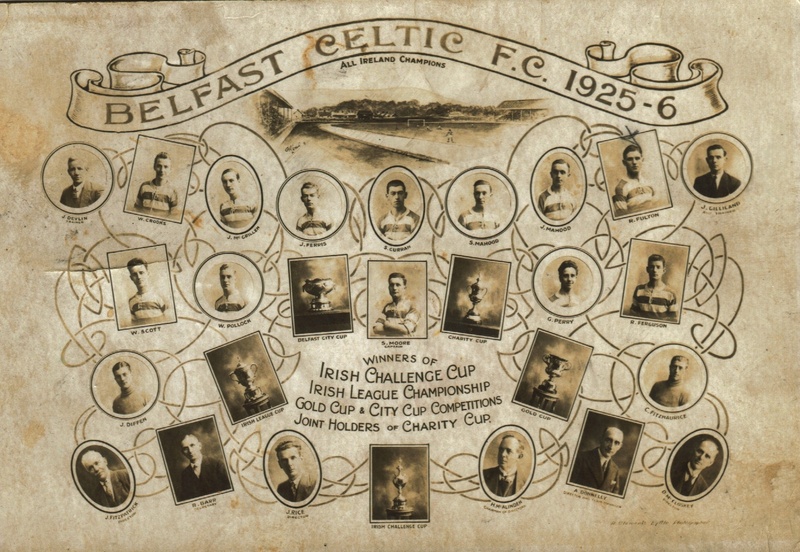 In 1952 Celtic came from Glasgow to play a friendly against the former Belfast Celtic team. That afternoon I was in town on my way home. I met a crowds of Tims from Scotland asking their way to the Falls Road. I got on the bus with them as their destination was near my home in Clonard. They were very down about our going out of football. They considered us brothers. That helped shaped me mentally. We formed St Peter's Celtic Supporters Club and I became vice-chairman. In 1959 I formed Barleycorn CSC to get many old friends and members who had left St Peter's back in the fold. The 1981 Hunger Strike really broke the back of the Barleycorn as members lived in various parts of Belfast. I still travelled to see the Bhoys until 3 years ago. But I still get my Celtic View and the Celtic Pools from head office. So you will see, I was born a Bhoy and am still a Bhoy at 85. I hope the recent murals and the Elisha Scott Memorial in the City Cemetery raised interest.